Written for readers who have some background in solid state physics but do not necessarily possess any knowledge of semiconductor lasers, this book provides a comprehensive and concise account of fundamental semiconductor laser physics, technology and properties. The principles of operation of these lasers are therefore discussed in detail with the interrelations between their design and optical, electrical and thermal properties. The relative merits of a large number of laser structures and their parameters are described to acquaint the reader with the various aspects of the semiconductor lasers and the trends in their development. Preface. 2. 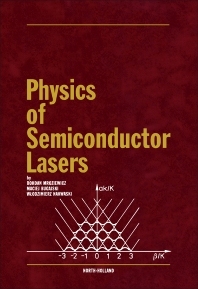 Physical principles of the operation of semiconductor lasers. 3. Basic techniques for fabricating semiconductor lasers. 4. The design and basic characteristics of semiconductor lasers. 5. Review of the structures and properties of Fabry Perot cavity junction lasers. 6. Structures of distributed feedback lasers. 7. Dynamic properties of junction lasers and methods for improving their frequency discrimination. 8. Thermal effects occurring in semiconductor lasers. 9. Principles of modelling the physical phenomena in junction lasers. 10. Reliability of LEDs and junction lasers. References. Subject Index. List of main symbols. List of abbreviations.